June 1942? on Books of KIPANGA. The airfield lies on a plain of waterless, uninhabited bush, immediately S. of the Mombasa-Nairobi road and railway, at Mackinnon Road station. Kilindini Harbour, Mombasa, lies 41½ miles ESE. Voi lies 36 miles NW. by W.
Access to Kilindini by rail and road. The airfield has its own siding, and the journey by rail to Kilindini takes 36 hours for goods, and 3 to 4 hours for passenger traffic. The distance by road is 6o miles (R) ; the road is not very good, and is unsuited to the towing of aircraft. Kilindini harbour has 5 deep-water berths served by railway tracks. There are several 3- and 5-ton electric mobile cranes, one 10-ton crane and a 60-ton floating crane available. Control Building adjacent S. of the landing strip junction. 16/34 QDM. 162°/342° .... 1700 X 100/200 yds. Strips of cleared, hand packed ground, each about 8oo x 33 yds., extend down the centre of the landing strips from their point of intersection. Note: The plan of Plate No. 39 shows, in open peck, the limits of the cleared area. The actual length of the landing strips is shorter by about 275 yds. at the "12" end of strip 12/3o, and by about 500 yds. at the "34" end of strip 16/34. All sectors safe for approach. One windsock, S. of landing strip junction. W/T station complete. details mot known, but one channel exists to R.N.A.S. 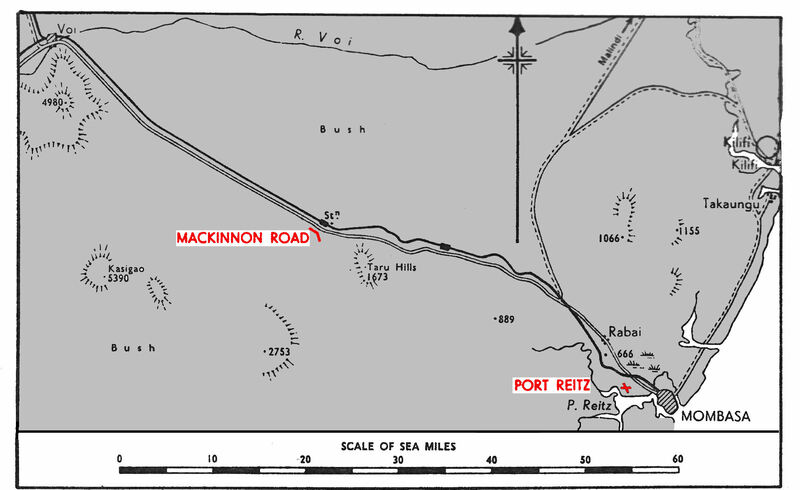 Nairobi, Port Reitz and Tanga. Living quarters in camp N. of railway, wooden hutting with concrete floors and thatch roofs. Armoury, Store and S.A.A.R.U. store building. On N. side of strip 12/30. Sick quarters on N. side of railway, immediately S. of camp. First Aid on airfield. Prevalent winds : November to March are NE. April to September are SE. Rainy seasons : March to May and October and November. The weather is suitable for flying all the year except for occasional days when the strips are U/S due to rain. No service while on Care & Maintenance. Aviation .............. Three 6.000 gallon tanks. A.R.S., general workshops, wood-workers and battery charging shop. Eastern Fleet Torpedo, Spotter and Reconnaissance Pool. 'B' flight operated here from RNAS Tanga 29.08.42 to 30.09.42. Equipped with Fairey Albacores and Fairey Swordfish. Equipped with 9 Fairey Albacore. 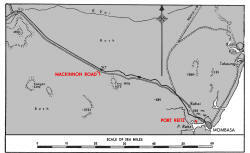 The Mackinnon Road site, 41½ miles NW of Mombasa was one of three locations selected for new naval airfields in Eastern Africa for the support of the Eastern Fleet operations in the Indian Ocean; the other two were at Voi, Kenya, 79 miles NNW from Mombasa, and Tanga, Tanganyika, 72 miles SSW of Mombasa. 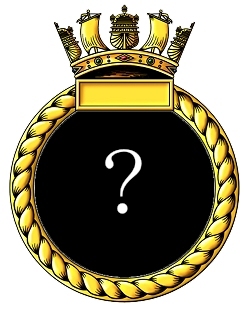 which flew ashore from the Fleet Carrier HMS INDOMITABLE on the 29th. 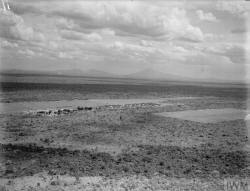 Work continued for several months to fully establish the basic airfield, much of the manpower was provided by the East African Military Labour Service (E.A.M.L.S. ), 350 of these native workers were billeted in a camp just North of the landing area on the far side of the road and railway. Other workers were recruited from local tribesmen, especially camp support staff such as cooks, and stewards. The Albacores remained ashore for the next five weeks before re-embarking in INDOMITABLE on July 9th. The next squadron did not arrive until mid-August when 881 Fleet Fighter squadron flew ashore from HMS ILLUSTRIOUS on the 19th, bringing 9 Martlet single seat fighters. 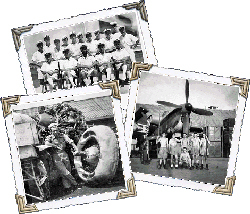 On the same date a second Fleet Fighter squadron was formed at Mackinnon Road - 882 squadron assembled with 9 Martlet IIs issued from the storage section at RNARY Nairobi. 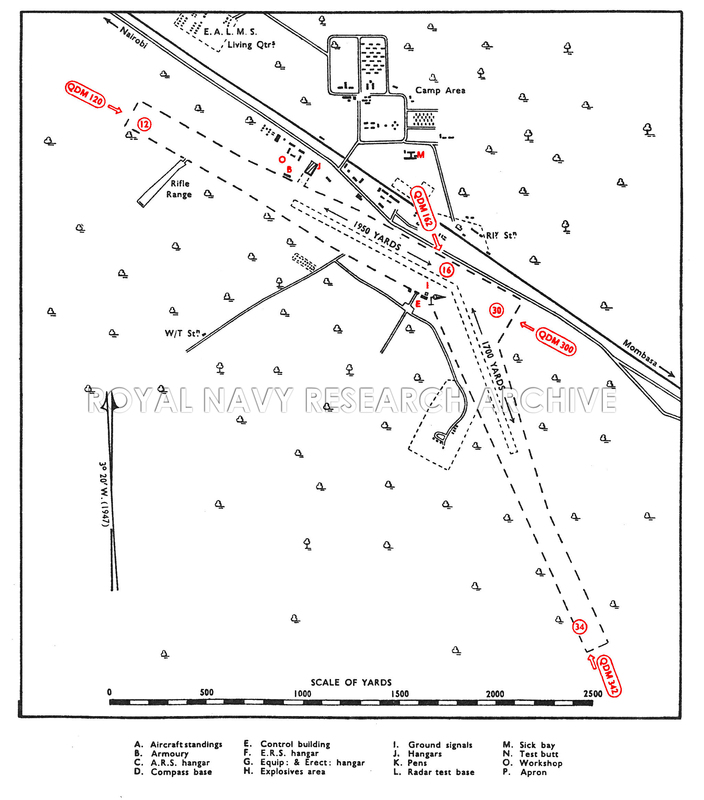 Ten days later a further unit arrived on the station when the Albacores and Swordfish of B Flt of 796 Eastern Fleet Torpedo, Spotter and Reconnaissance Pool squadron based at RNAS Tanga arrived for a month long detachment on August 29th. The newly formed 882 squadron was to be short lived, being absorbed into 881 on September 5th 1942 to increase its equipment to 18 Martlet IIs. The new, larger 881 flew out to re-embark in HMS ILLUSTRIOUS the following day. Their place was taken by 795 Fleet Fighter Pool Squadron's Fairey Fulmars and Grumman Martlets which moved here from RNAS Tanga on September 19th. B Flt of 796 squadron returned to RNAS Tanga on the 30th leaving only 795 squadron flying from the airfield on refresher flying training duties. Half (? )of the new, larger, 881 returned to Mackinnon Road on October 20th when B flight was flown ashore from HMS ILLUSTRIOUS. They stayed until December 7th before rejoining ILLUSTRIOUS; this was the last use by a disembarked carrier squadron, the station's sole occupant was now 795 Squadron which continued its training role until being disbanded here on August 11th 1943. 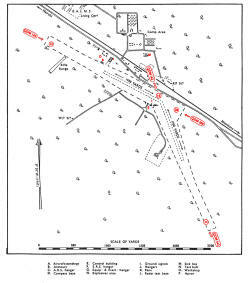 After only sixteen months of operations RNAS Mackinnon Road was no longer needed, no father use of the airfield is recorded. On May 15th 1944 it was reduced to Care & Maintenance status on the books of H.M.S. 'Tana' at three months notice to re-open.